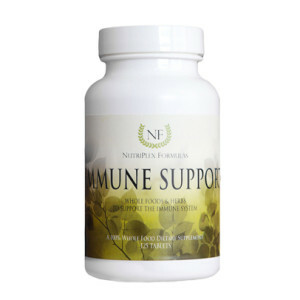 Immune Support contains powerful nutrients that the immune system needs to support the defense system of the body. Viruses, bacteria, free radicals, and toxic foods and substances are common in today’s world and the modern diet. Excellent for all health states and the organs and biological functions involved in the immune system! Organic Acerola Cherry*, Astragalus*, Carrot*, Garlic Bulb*, Maitake Mushroom Extract*, Green Tea Leaf*, Echinacea Purpurea Root, Eleutherococcus Senticosus and Untreated Wheat Germ. In addition to the unique properties, synergists and cofactors of this food, each serving provides the following nutrients contained within the above food-nutrient blend (not as isolates): Vitamin A, Vitamin B, Vitamin C, Vitamin D, Vitamin E, Carotenoids, Complex Polysaccharides; Minerals, including: Selenium, Antioxidants, Bioflavonoids, Trace Mineral Activators, Amino Acids, Enzymes, Chlorophyll, Trace Minerals, Amino Acids, Phytosterols and more. The immune system is one of the most important treasures of preventive healthcare. In a world of exposure to toxins, temperature extremes, bacteria and viruses and environmental assaults, a strong immune system has been shown to protect against illnesses, enhance healing, ward off infection and common cold, quicken healing time, enhance white blood cell response, and contribute to a state of wellness. Further, medical researchers show that suppressed immunity impairs the natural healing process and contributes to a host of diseases, either as a primary or secondary causation. Immune-supporting foods are a beneficial for prevention, healing and repair mechanisms, improved cellular function. Immune Support may be used as an adjunct to wellness programs, prescription drug usage or nutritional-healing regimens.